The official website for the best-selling author of My Best Friend's Girl, The Ice Cream Girls and The Woman He Loved Before. The Cupid Effect was my first novel to be published and it recently received a revamp with a new cover, which is why I wrote a new introduction to it, explaining why it is so special to me. It’s 3.30 a.m. on a dark October morning and I’m wide awake because I’ve just finished writing my next book – The Ice Cream Girls – and my body clock is out of synch with . . . pretty much everything. I have a few months’ worth of taped programmes to catch up, a pile of admin that will probably bury me if it topples over and a suspicion that all the things I promised to do ‘once I’ve finished the book’ will require my immediate attention. But, I love this about my life. I love writing and everything that has to fit around it. And, since I really should try to get some sleep/reorder my flat/revert to normal eating habits/get my ‘normal’ life back, I thought I’d remind myself and you all about where my writing career started, by reproducing below the new introduction to The Cupid Effect. 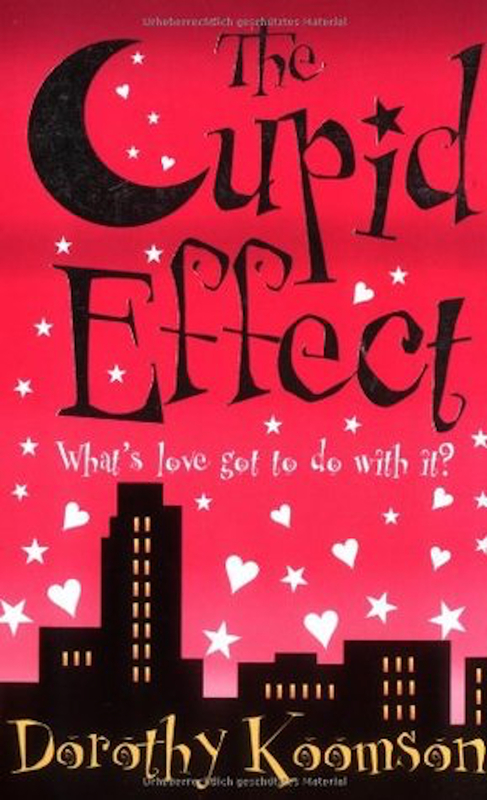 The Cupid Effect was my first novel to be published and it recently received a revamp with a new cover, which is why I wrote a new introduction to it, explaining why it is so special to me. Hope you enjoy reading this little love note to The Cupid Effect, and I’ll see you next time when my life will be a little more ordered-ish! The Cupid Effect: Where It All Started Every time I go into a shop that sells books, I always check to see if they have any of my novels. Even now, over half a decade after my first book was published, I still feel a thrill to see my name ‘in lights’; experience a glow of pride to see my words on a shelf. I must admit I get an extra thrill whenever I see The Cupid Effect. I love all my books equally, it’s just (to loosely paraphrase George Orwell) I love Cupid a fraction more equally than the others. Cupid may not be the novel that put my writing in front of a worldwide audience, but I will always have a special affection for it for many reasons. One reason is that I share certain similarities with the main character. I’m always at pains to point out that I am not my main players, but if I was forced to name a character I share most traits with, it’d be Cupid’s Ceri D’Altroy. She and I are both sci-fi geeks who are obsessed with the same TV show; we’ve both taught psychology; and we both have a large number of long-sleeved tops in are sartorial repertoire. Probably most crucially, we both have a habit of listening to people’s problems then giving advice we really wish said advisees wouldn’t take. Another reason for my big love for Cupid is that it makes me laugh. It has its serious moments, but there are many, many scenes and phrases that tickle me enough to make me LOL (as the kids say). I laugh mainly because I can remember what inspired that particular scene or phrase. My love of Cupid is that bit deeper, though, because it is my first born. The novel that allowed me to drop the first two letters of ‘unpublished’ and brand myself a published novelist. That day in February 2003 when I walked into a London bookshop and saw my name emblazoned upon the cover of a book is a day that permanently changed my life. It represented the culmination of months of writing every second I wasn’t earning money to pay my bills. It represented years of reading, writing and dreaming. It represented everything I’ve wanted since I was 13 years old and wrote my first full-length story. It represented me daring to follow my heart. Cupid is essentially a book about having the courage to follow your heart and accepting that the power to change your life is in your hands. Not necessarily quitting your safe job and trying to do something you’re not sure you’re qualified for, like Ceri does, it is more about seeing what you would like to alter and striving to effect that change. Even if it is just a case of changing how you view your current circumstance. 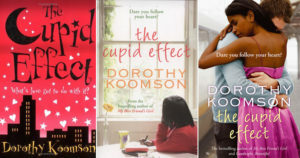 As I said, I am proud of every single one of my books, and I love seeing them on the shelves of shops, so I’m especially excited that I’ll be seeing The Cupid Effect, ‘out there’ again, with a brand new cover: it’ll be showing me and the world where I started and how far I’ve come.